Think back to the last wedding you went to. Or the last birthday party. Even the last nice dinner. Odds are you took multiple photos, dozens even. Maybe you even uploaded one to Instagram. But have you looked at any of them since? Or sent them to anyone? Probably not. And if you did, it wasn't particularly easy. The way we take photos has changed in extraordinary ways over the last 100 years, evolving from a box and a plate to a chip and a sensor. But what we do with those images afterwards has remained pretty much unchanged. More often than not, we throw them in a box, either cardboard or byte-based, never to be looked at again—until, perhaps, our progeny discovers them in our attic (again, real or digital). It's an odd paradox that though we're taking more photos than ever, we tend not to look at them any more often. Fireside, a Palo Alto company that launches its first product today on Kickstarter, wants to change that by applying the same machine learning that Pandora and other companies have applied to content management. The idea is simple. Fireside's iOS or Android app pulls your photos and videos from any device or storage system you have—and includes your family's, too—into a cloud-based "channel." It's similar in functionality to apps like 23Snaps, except for one major difference: Fireside uses machine learning to organize your rolls "contextually," reading information not only about when and where they were taken, but also who and what are shown in each photo. Then it creates playlists of photos and videos organized around specific events and themes and pushes them onto a "smart" frame that pulls playlists via Wi-Fi onto its 15-inch, 1080p screen. There's obvious allure in a simple, mobile-accessible cloud storage system that brings together content from every device in your family and organizes them, too. Fireside's CEO Andy Jagoe explained yesterday that the user experience is directly informed by his experience as a new dad. "When you have kids, so many things change. You have less time than ever before, and everyone in your whole family is asking you for links to pictures, new videos, and all these things come to a head at the same time," he said. "And we thought, there's got to be a better way." Fireside wants to take all that contextual information about your photos and throw them back into the real world. That's a clear problem with a clear solution in the form of Fireside's app. The frame is part of that solution, too. Designed by Fireside co-founder Don Lehman (a sometimes-contributor here at Gizmodo), it's a beautiful take on a product category that has long seemed like the dumber cousin of a computer monitor. It's slim and crystal clear, and the only real decorative flourish is on the back, in the form of a hoop-like stand that comes in chrome or copper. Clearly, the frame is designed to fade into the background, foregrounding the images and video themselves. Since Fireside is a Kickstarter, there are still plenty of questions about this as-of-yet-unreleased product will function. 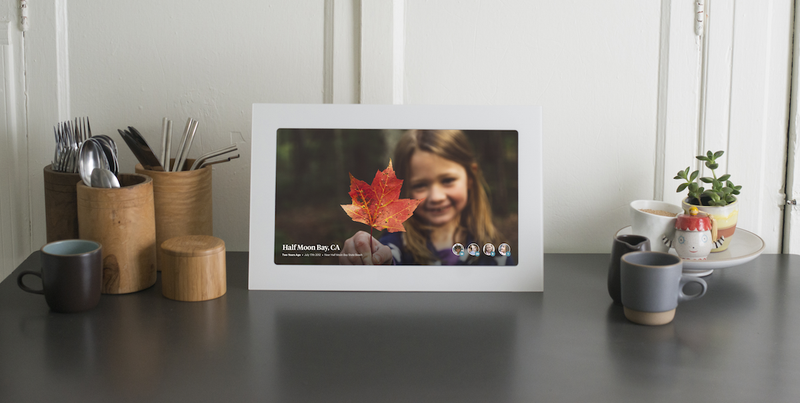 Digital photo frames haven't quite found a footing with consumers yet, and it's unclear if demand is there. Likewise, the app's sorting algorithm sounds wonderful, but we haven't seen it in action just yet, though the need for a frictionless photo storage and sorting app is certainly clear. Still, Fireside's promise of fixing and resurfacing the morass of photos strewn across your phone, computer, storage systems, and backup drives is intriguing. And if it can deliver on taming that beast with a little computer learning, it could mean never having to scroll through another messy, endless photo roll searching for that one photo again. Check it out on Kickstarter here.